The Dunstable site record has fallen. Yes, again! In less than 3 years. The picture is clear. To get away from Dunstable is not easy. To set a site record is even harder. 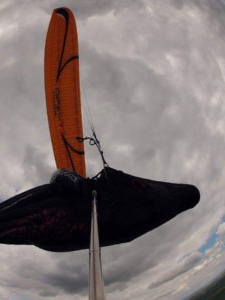 To do it with a stiffy is hard but a floppy paraglider. Surely not possible? Well, on 28th April 2016 Karoly Megyesi set a new site record when he flew 157.6KM on… Yes, you guessed it. A floppy! A niviuk Icepeak 7 Pro floppy to be precise. It seems that getting away from Dunstable requires what would seem to be poor flying weather. All records to date have been set on ‘poor’ days. 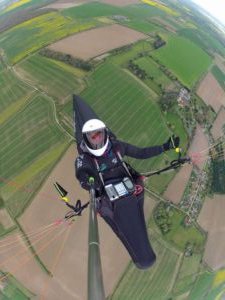 In 1998 Pete Roberts required a ground crew to hold him down as he launched his Hang Glider into very high wind. 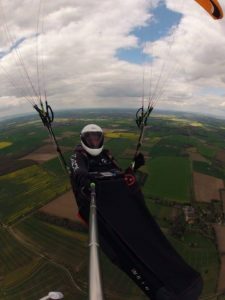 In 2013 Andrew Hollidge was the only person flying and scrapped up to 2500′ and stayed there cruising along on his Hang Glider. And the latest flight by Karoly is very similar to Andrews with a large proportion of his flight being 2500′. After looking through the track log I noticed, in sheer disbelief, some incredible stats. A low save of 709′ (just 600′ AGL), a top speed of 82.8KM/H and a duration of just 4hrs 49 mins. It looked also like a flight of two halves with the first leg being very different to the 2nd. Intrigued, I asked Karoly to describe his flight. He said “I wanted to make the coast but landed early” ! “Ok so this is how it happened. I knew from the weather forecast that a front will be approaching to Dunny around 2 o’clock so my plan was to takeoff early and leave the strong wind and rain behind. When I arrived to Dunny, around 9:30, people were already climbing. Especially Andy Wade. So, I was thinking this is looking better than what the weather forecast was predicting! I prepared, I put the gear together and took off. Immediately I could feel that this will be a great day. The thermals were very steady and reliable at 10 o’clock! I climbed out with the second thermal to around 2500ft. It was very early so the cloudbase was low but the clouds were close to each other even at that height. I wondered if I could make a very fast flight towards Cambridge. I found some magical lines pushing full bar and not sinking at all, sometimes hitting the 80-90km/h speed ! I stayed on bar all the way to Cambridge and made it there in around 1 hour 15 min (60km). Thermals were strong with 4-5m/s and I was banked over and biting into them. After Cambridge the conditions started to disintegrate and that slowed me down but there were still some weak climbs and I managed to hold on. I had to change my flying, thermaling as flat as I could with just 1 up on the vario. I held on and held on. 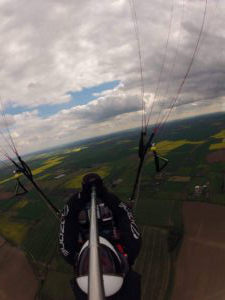 Jumping between climbs and maximising my glide flying at trim or with half bar. When I got to Bury St Edmunds I felt the wind had picked up and the direction changed to SSW so the thermals were broken up and drifting a lot! Most of the time I was very close to the ground but I never thought I would go down. I was enjoying the flight and somehow I always found a sunny spot within the big shadows. Tractors and combine harvesters saved me and I even headed towards some running horses who sent up some thermals for me! In the meantime I was getting closer and closer to the coast it was a very exciting moment. It had been a strange, fairly low flight, with me only once getting a good enough height gain to make cloud base. I had taken off from Dunstable in the middle of England, flown over totally flat terrain and there in the distance was the coast! I had been low for the last few km and was still low. I looked at my distance and I knew I could take the site record. But now there was a new game on. Will I make it to the coast? I want to make the coast! I really want a photograph of me with an ice cream to send to the lads at Dunstable. With visions of my glorious photograph of me proudly holding my ice cream trophy in the air my mind was suddenly set on this new egotistical goal. I had transitioned from a fun flight with no aim to a desire to reach a goal and an ice cream. Maybe having a goal is not a good thing as unfortunately on the last climb I made a few bad decisions. I followed a bird instead of staying on the sunny spot, I hit a sink and, being low, I was not able to get through it and landed. I was very happy. Not just because I had a great flight but I was very cold and tired and it was a relief to be back in the warm. I was delighted to see a bus station just 500yds away. So, I caught a bus to Ipswich and from there got the train to London. I was home by 9PM and still thinking that I could have made it to the coast if I had been more patient with that last climb.